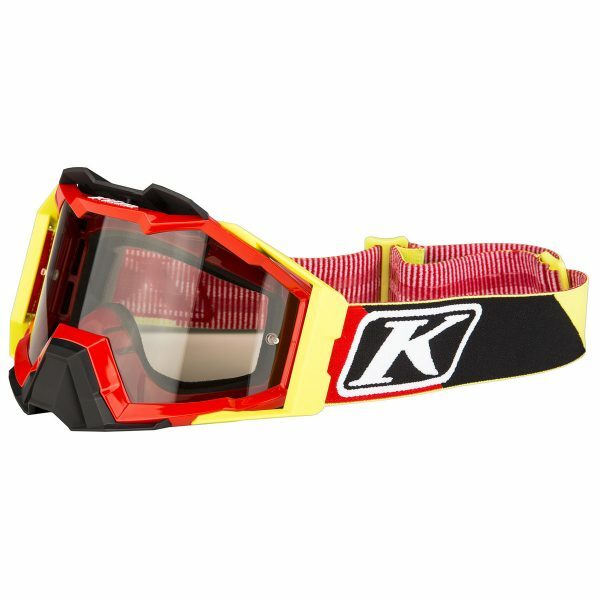 A clear view ahead: The brand-new Viper goggles by KLIM should be part of every off-road enthusiast’s core kit! The premium equipment manufacturer KLIM – renowned for exceptionally well made motorcycling clothing lines – has developed new off-road goggles. – GEMIN-EYE ANTI-FOG: A layer applied directly onto the goggle lens prevent it from fogging. – VENTILATION: The Viper PRO goggles have been engineered to perform in extreme conditions. By combining ventilation along the upper rim of the goggles and fresh air from the lower goggle frame, air circulation is generated, which ensures a clear view. – POLYCARB PREMIUM UV400 LENS: The goggle lens has been developed especially by KLIM – more durable and resistant against scratches, it is beyond compare. – GEOMETRY: The shape of the Viper and Viper PRO has been designed to offer the largest possible field of vision. Every part of the goggles has been constructed in such a way that it disappears from the field of vision when putting them on. A FIRST FOR KLIM: For the first time ever, KLIM is offering a roll-off system. Exclusive and only for the brand-new Viper goggles. How off-road goggles perform is of the utmost importance! Moisture management, ventilation, perfect fit and durability is just as important in goggles as it is in every other piece of off-road equipment. KLIM Viper and Viper PRO keep redefining the joy of riding a motorcycle – on every new adventure. These goggles have been developed to offer the best clarity, the best visibility and the best fit. The Viper PRO is available in 3 colours: black, red and orange. There is a whole range of different matching lenses to individualise the design. The RRP of the Viper PRO is 99.00 EUR, for the VIPER 59,00 Euro. The roll-off system is available for 59.00 EUR.